Nothing beats the flavor of blackened Mahi Mahi – but knowing how to blacken Mahi Mahi can be overwhelming if you’ve never tried it before. 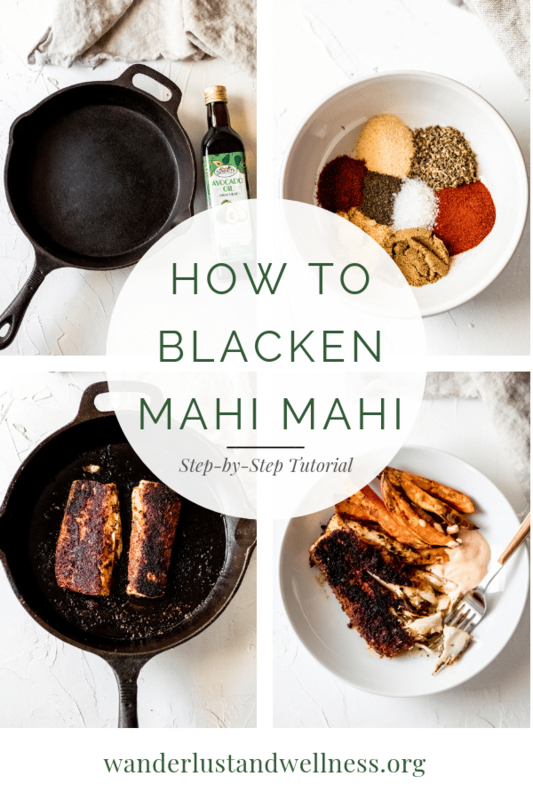 I’ll walk you through the entire blackening process so you can enjoy your own blackened Mahi Mahi right at home. You’ll also be able to find this tutorial included in our collection of Mahi Mahi recipes, too! From what type of skillet to use to the best cooking oil for high temps, as well as spices for blackening to how to get just the right amount of char – we’ll cover it all in this tutorial. Blackening fish or poultry can seem daunting if you’ve never tried it before. If you’re not careful, you can end up with a house full of smoke and a burnt skillet – but we don’t want that to happen, right? In this tutorial, I’ll walk you through everything from what skillet to use to choosing the right cooking oil, as well as blackening spices and cooking time to get that perfectly blackened crust. 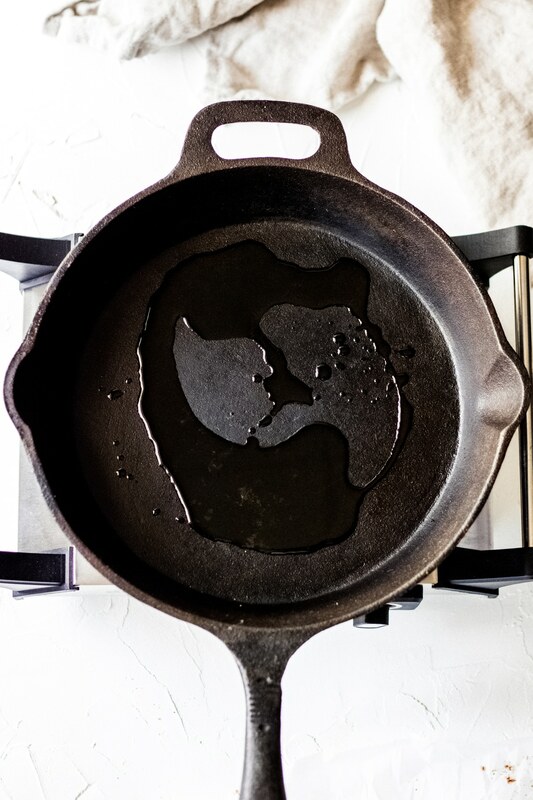 Choosing the right skillet and cooking oil. To properly blacken Mahi Mahi it’s important to choose the right type of skillet and the right cooking oil. 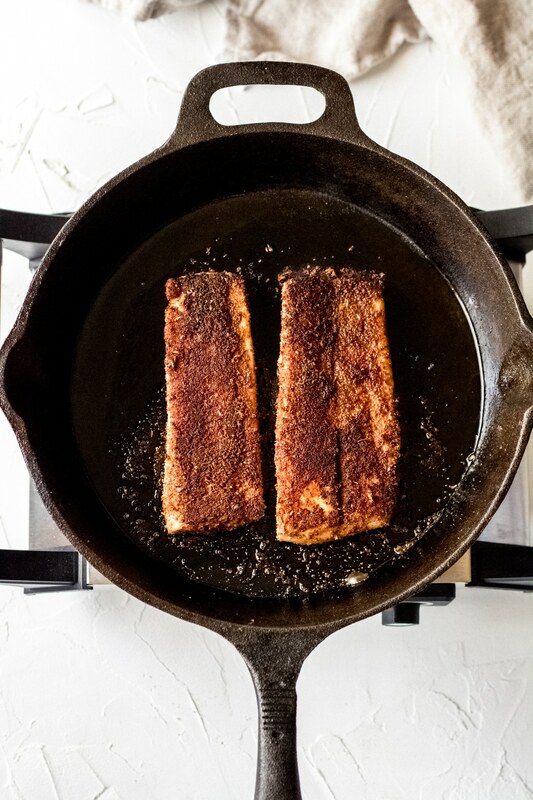 I recommend using a cast iron skillet for blackening fish or poultry because cast iron can withstand higher cooking temperatures – which is needed for the blackening process. Also, cooking oil is important. You’ll want to use a cooking oil that has a high smoke point – like avocado oil. 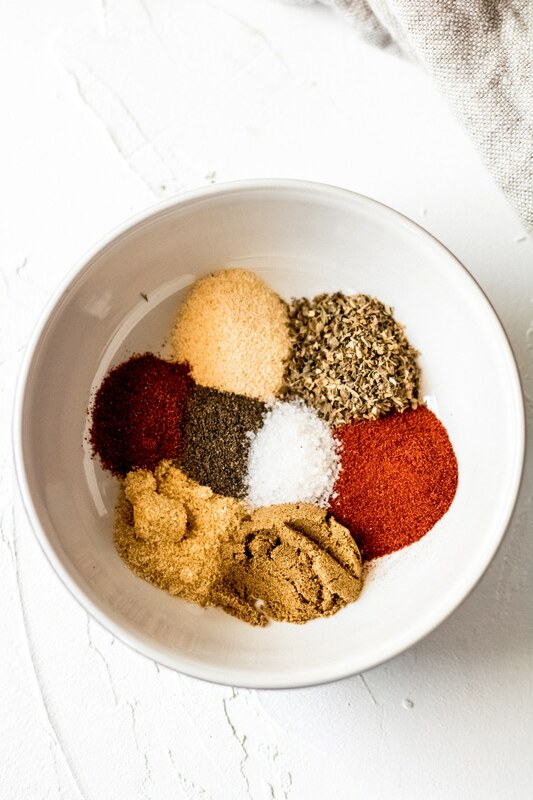 Make your own blackening spice mixture. 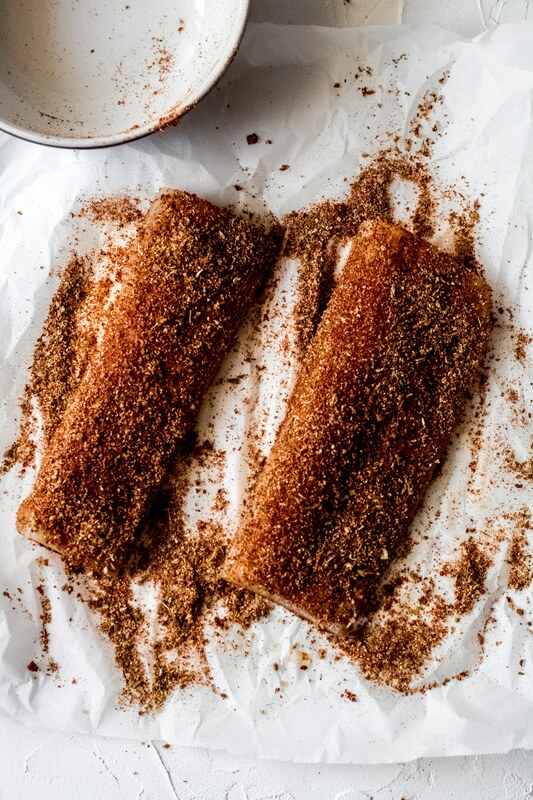 Coat your thawed Mahi Mahi fillets with the blackening spices. Before cooking, heavily coat both sides of the Mahi Mahi fillets with the blackening spices. Heat up the cooking oil in the cast iron skillet over medium-high heat. 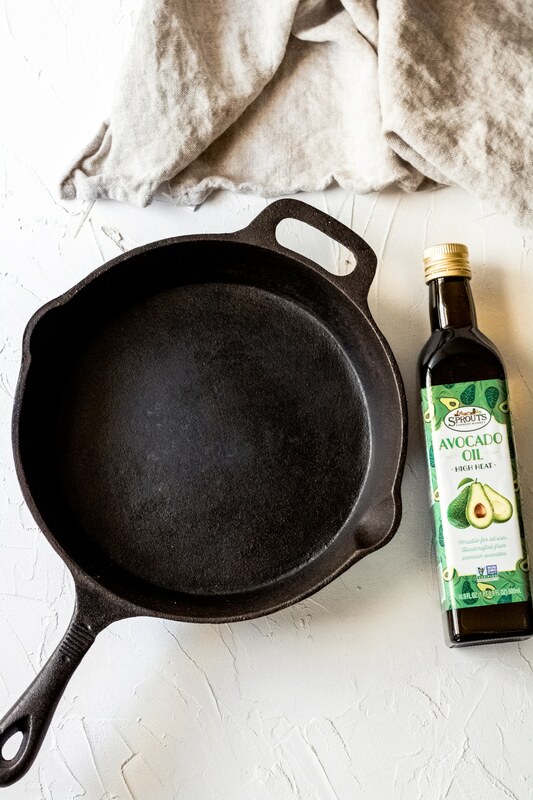 Add 2 tablespoons of avocado oil to the cast iron skillet and heat over medium-high heat. Add Mahi Mahi fillets to the hot oil and cook for 3-4 minutes on one side – then flip and cook for another 3-4 minutes on the other side. Getting that perfect blackened crust. After the fillets have cooked on both sides, you can check both the internal temperature and use a fork to pull apart a small part of the fillet to see if it’s white and flaked. 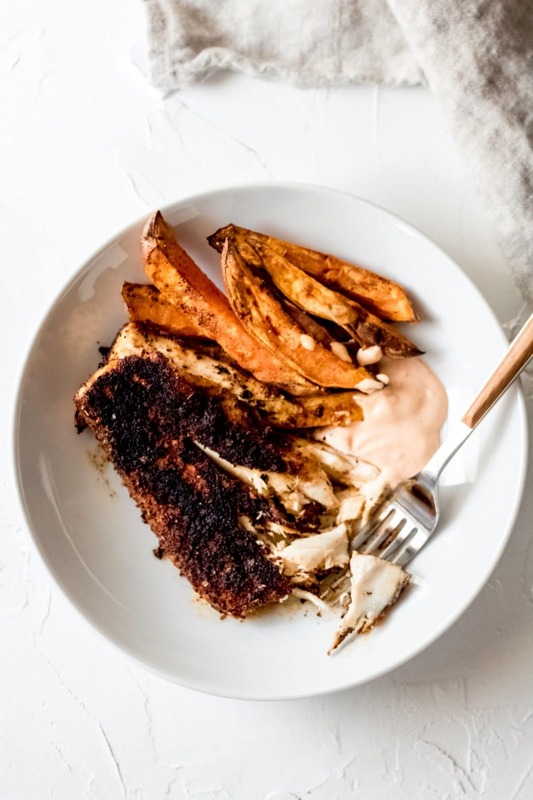 The optimal internal temperature for Mahi Mahi is 137 degrees F. If you feel like the crust is getting too blackened, you can continue to flip until it’s done; however 3-4 minutes on each side should result in the perfect blackened crust. While it may look burnt, the blackened color is actually the charred spices combined with the cooking oil. Blacked Mahi Mahi does not taste burnt at all. It depends on the spices included in the blackened seasoning. In this particular recipe, cayenne pepper is included so it does carry a heat to it. What does blackened fish mean? Blackening is a cooking technique commonly used with fish or poultry. It uses a combination of spices and flash cooking at a high temperature. 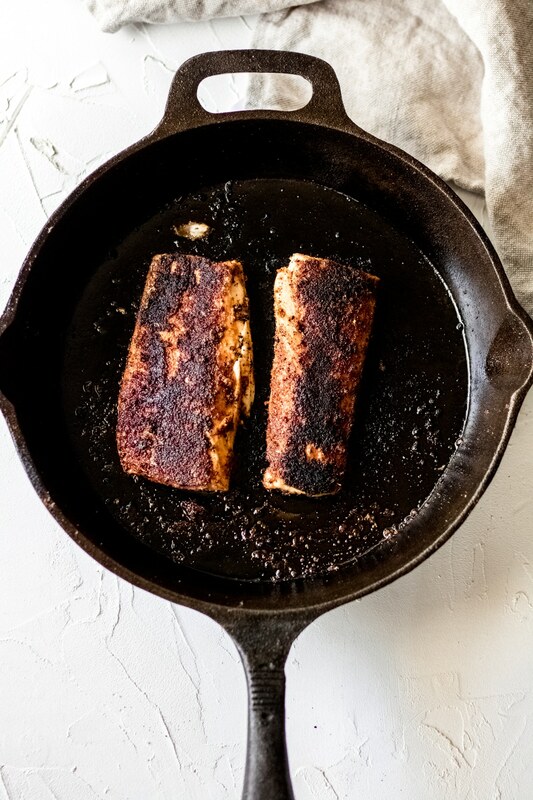 What is a good side dish for blackened fish? Potatoes or rice is a good side dish choice for blackened fish. Most blackened recipes have a bit of a spicy kick – so having a soft side dish that can help balance that heat is always a good choice. Enjoy these other cast iron skillet recipes! 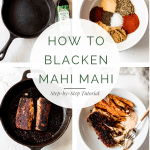 This step by step tutorial will walk you through how to blacken Mahi Mahi – from skillet to cooking oil to spices to cooking time – we’ll cover it all! In a small bowl, add all of the spices and stir to combine. Add the avocado oil to a cast iron skillet, and heat over medium-high heat. Generously coat both sides of the Mahi Mahi fillets with the blackening seasoning. Once the oil is hot, add the Mahi Mahi fillets and cook for 3-4 minutes on one side, then flip and cook for an additional 3-4 minutes on the other side. The fillets will be done when they reach an internal temperature of 137 degrees F. and easily flake with a fork. Be sure to use thawed – not frozen – fillets. You can use butter or ghee if you do not have access to avocado oil.